Princess Eugenie of York swapped "I dos" with groom Jack Brooksbank at St. George's Chapel Friday morning, but the bride's beautiful gown wasn't the only fashionable look in the spotlight. 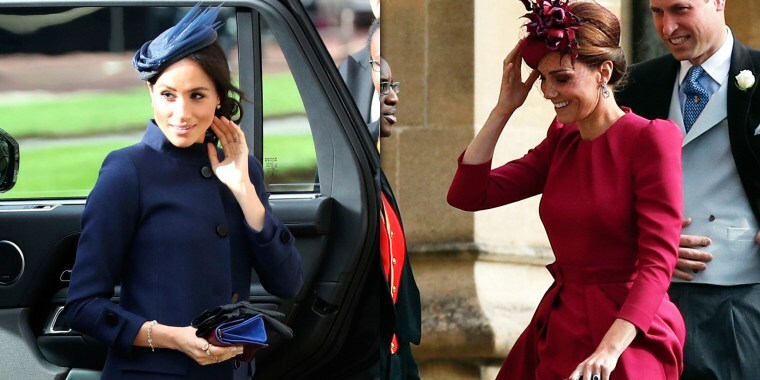 Catherine, Duchess of Cambridge, and Meghan, Duchess of Sussex, both wore dresses that not only looked picture-perfect at the event, but also served as designer reminders of their own royal weddings. The former Kate Middleton wore a bright berry dress, pleated at the neck and hips, from her go-to label Alexander McQueen. Teamed with a matching fuchsia fascinator from Philip Treacy and black pumps, she offered a bold splash of color on the blustery day in Berkshire. The duchess has regularly returned to McQueen designs ever since she sported her most memorable one to date — her own wedding gown. Another reminder of the Duchess of Cambridge's wedding was the presence of her sister, Pippa Middleton, who's currently pregnant with her first child. As for the newest duchess, the former Meghan Markle, she went with a navy blue coatdress from her own preferred label, Givenchy. To complement her look, she sported a hat from Noel Stewart, with navy heels and a matching clutch. And like her fellow duchess, she, too, repeated her wedding-day designer. The princes who accompanied the pair stuck with the traditional attire for male guests, as both William and Harry wore morning suits for their cousin's special occasion.